Boudhanath (Devnagari: बौद्धनाथ) (also called Boudha, Bouddhanath or Baudhanath or the Khāsa Caitya) is one of the holiest Buddhist sites in Kathmandu (Yambu), Nepal. It is known as Khāsti in Nepal Bhasa Jyarung Khasyor in Tamang language or as Bauddha by modern speakers of Nepali. Located about 11 km (6.8 mi) from the center and northeastern outskirts of Kathmandu, the stupa's massive mandala makes it one of the largest spherical stupas in Nepal. 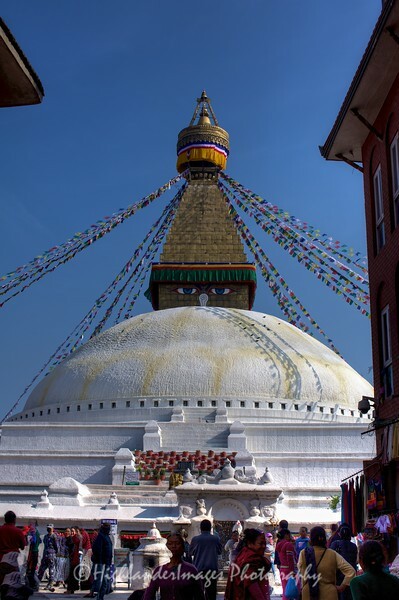 The Stupa is on the ancient trade route from Tibet which enters the Kathmandu Valley by the village of Sankhu in the northeast corner, passes by Boudnath Stupa to the ancient and smaller stupa of Cā-bahī (often called 'Little Boudnath'). It then turns directly south, heading over the Bagmati river to Patan - thus bypassing the main city of Kathmandu (which was a later foundation). Tibetan merchants have rested and offered prayers here for many centuries. When refugees entered Nepal from Tibet in the 1950s, many decided to live around Bouddhanath. The Stupa is said to entomb the remains of Kassapa Buddha.